Obama's No-Win Immigration Predicament : It's All Politics The president's announcement that he would shift immigration enforcement resources to the Southern border failed to placate anyone. 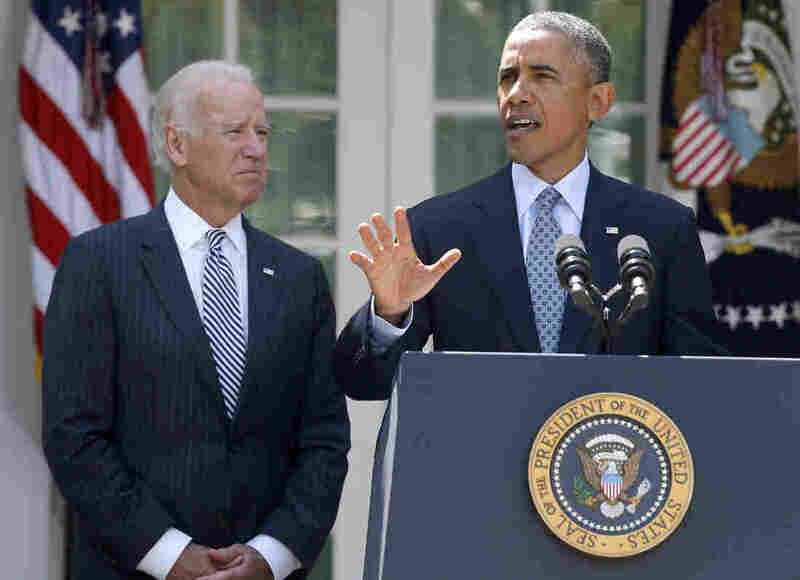 President Obama, accompanied by Vice President Biden in the White House Rose Garden, lashed out at House Republicans for stalling immigration legislation. President Obama's tough predicament on immigration is only getting worse. He certainly didn't want to be dealing with an influx of unaccompanied minors illegally entering the U.S. across the Southern border, overwhelming the Homeland Security Department's ability to deal with them during a critical midterm election year. Obama also presumably didn't want an immigration bill passed by the Senate a year ago to sit, forsaken, in the House. But that's happened too, with Speaker John Boehner, R-Ohio, recently telling the president the Republican-controlled House won't take up legislation to overhaul the nation's immigration laws this year. Responding to the first problem, the children who are illegally crossing into the U.S. and mainly coming from Central America, Obama announced Monday that he will be seeking more resources to address that influx while shifting current resources to the border — an announcement that not only failed to placate anyone but served to upset immigration advocates. In a letter to Congress, Obama said he will be asking for additional resources — more than $2 billion, according to reports — to help manage what he called a "humanitarian crisis" at the border. Besides facilitating the surge of more immigration judges, asylum officers and Immigration and Customs Enforcement lawyers to the Southern border to deal with the influx, the president was also asking Congress to extend extra authority to Homeland Security Secretary Jeh Johnson that would allow him to use more discretion in returning minors to their home countries. That would sidestep safeguards Congress placed in law to give children more protection than adults because of their greater vulnerability to human trafficking — a result that angered and surprised immigration advocates. "I was actually stunned," Kevin Appleby, director of the U.S. Conference of Catholic Bishops' office of migration policy and public affairs, told It's All Politics. "I think they've been trying to beat back their critics on their harsh enforcement record over the last year or so," he said, referring to the administration's aggressiveness in the use of deportations, which has been sharply criticized by immigration advocates and Latino groups. "To double down on that at this point surprised me." Appleby attended a White House meeting on immigration last week and said administration officials didn't mention that they planned to request more money or reverse the protections in the law for child immigrants. What's more, Appleby said, because many of the children are fleeing violence in their Central American homelands, they are more refugees than immigrants. "The administration's move has sparked outrage among advocates for children and refugees and immigrant rights advocates and for good reason," said Marielena Hincapie, executive director of the National Immigration Law Center, in a Monday teleconference with reporters. "If Congress authorizes this request, the Obama administration will be shuttling children right back to the dangerous situations they escaped without allowing them the opportunity to fully present their cases in court." Obama's frustration was clear Monday in a White House Rose Garden statement that the GOP's refusal to even take up immigration legislation left him no alternative other than to use the type of executive action they criticize as usurping congressional authority to try to address some of the border problems. "If House Republicans are really concerned about me taking too many executive actions, the best solution to that is passing bills. Pass a bill," Obama said. "Solve a problem. Don't just say 'no' on something that everybody agrees needs to be done." Obama said he asked Attorney General Eric Holder and Johnson to review actions he could take on immigration without Congress and he promised to approve them this summer, seemingly even before knowing exactly what the members of his Cabinet would recommend. For Obama and congressional Democrats — given the vow he made to Latino voters that fixing the nation's broken immigration system would be a second-term priority — his promise of executive action beat doing nothing. And doing nothing would risk alienating a significant part of his base as Democrats try to hang on to their small majority in the Senate. Boehner responded in a statement that the president was to blame for the impasse, saying that House Republicans don't trust that the president would faithfully execute new immigration laws if they passed and he signed them. "In our conversation last week, I told the president what I have been telling him for months: The American people and their elected officials don't trust him to enforce the law as written," Boehner said in a statement. "Until that changes, it is going to be difficult to make progress on this issue. The crisis at our southern border reminds us all of the critical importance of fixing our broken immigration system. It is sad and disappointing that — faced with this challenge — President Obama won't work with us, but is instead intent on going it alone with executive orders that can't and won't fix these problems."